Below are current volunteer opportunities with the Woodbury Heritage Society. If you'd like to learn more about volunteering with the WHS, please contact Wayne Schilling at [email protected] or call (612) 790-2388. Purpose: The Collections Data Entry Assistant serves to enter the scanned documents into the Past Perfect Museum Software data collection software. Location: The Collections Data Entry Assistant works in the Woodbury Heritage Society Office now located in the Woodbury City Hall. In the near future the office will be moved to the Public Works Building located at 2301 Tower Drive. Time Commitment: One day per week - Wednesday afternoon, flexible hours at home possible. Minimum of three months. Qualifications Basic knowledge of computer and data entry. Pleasant manner, patience, problem-solving ability, dependability. Purpose: The Heritage House Gardener serves as the person in-charge of the garden on the grounds of the Heritage House. Qualifications Good knowledge of plants and vegetables. Knowledge of organic gardening methods and techniques. Pleasant manner, patience, problem-solving ability, dependability. Purpose: Publish a quarterly newsletter (Heritage Happenings) to share information, maintain visibility and gain support for the Woodbury Heritage Society. Qualifications Basic knowledge of computer and publishing software (Publisher or equivalent). Pleasant manner, patience, problem-solving ability, dependability. Purpose: A docent is a creative, imaginative, enthusiastic individual who provides interpretive services to visitors. This includes hosting Sunday Open House in the summer and School tours in September. September (School Visits): School class visits are usually one hour in length. The class is supervised by their teacher and typically several other adults. Qualifications Like working with adults and children, pleasant manner, patience, problem-solving ability, dependability. Purpose: The Heritage House Handy Person serves as the person in-charge of maintaining the Heritage House and grounds (excluding the gardens). Location: Radio Drive at Lake Road in Woodbury. This property covers approximately 10,000 Square feet, about the size of a small city lot. Purpose: The committee will set the standard for the entire capital campaign. Committee's key role will be to design and develop the campaign plan. Purpose: The fundraising committee will raise contributions of money or other resources, for sufficient capital to restore the Miller Barn for multi-use of the barn to celebrate our community's heritage, to educate young and old on the history of those families and peoples who founded the community. Purpose: The Events Committee's goal is to design and implement "friend-raiser" events to kick off campaigns and mark successes of the Save the Miller Barn efforts. 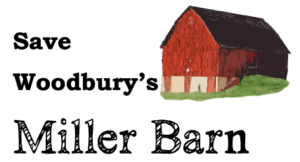 Purpose: The Communication Committee's goal is to clearly communicate and actively share the Save the Miller Barn mission and outcomes to internal and external audiences through talks, video, newsletters, the web site, media, and strategic partners. Fun, Exciting and Significant event to help Save the Miller Barn! Host a fundraising event and have the proceeds benefit the Save the Miller Barn project. Put together a house party that brings in plenty of donations while showing guests a great time! If you're looking to raise money for a good cause without the extravagance of a full-on gala, having a house party can be great as a simpler, more intimate alternative. Held in someone's home, a fundraising house party can help you raise thousands of dollars within just a couple of short hours. What are the key ingredients for a successful house party? A good house party does not require a large or luxurious house as its venue; what it does require is an enthusiastic host who cares about a good cause that will help the community. The Miller Barn structure is vulnerable to deterioration from the elements and to potential demolition in the face of development of their surrounding property. It is imperative to preserve this barn and surrounding acreage as one of the cornerstone structures for the Woodbury Community. If interested in helping in a fun way to help save an important landmark, contact Joyce at [email protected] for a party packet on "How to host a Miller Barn house party."